One of the little perks of working at the library is book donations. People will donate just about any book to their local library. Most donations are your standard popular fiction. Those types of donations we stick immediately on our book sale shelves. Another large section of donations is old books covered in mold which we immediately put in our recycling dumpster. It's still shocking after all these years at the library to see some of the absolute garbage people think we could use. A PC user manual from the early 90s? No thanks! A box of moldy fiction that was popular in 1973? No, thank you! Part of it, I think is that people cannot admit their book collection is worthless. You know, sometimes it is. I'm sure when I die and my large collection of Robert Heinlein paperbacks shows up at some library a worker there will look at that box and say, "WTF?" Sometimes you come across a nice little find though. The other day I noticed a book printed in 1944 called "Battle Report: Pearl Harbor to Coral Sea." Its pages have browned over the years and it's falling apart but, as I was flipping through it, I saw a note accompanied by a drawing on the front page. 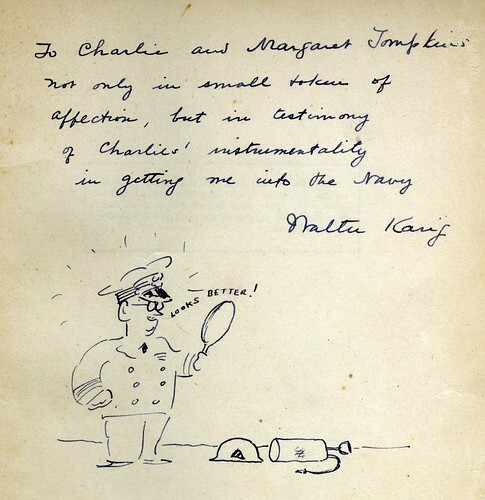 It's a message from someone named Walter to Charlie and Margaret Tompkins. Walter is thanking Charlie for being instrumental in getting him into the navy. Upon closer reading I noticed that writer of the note is Walter Karig, one of the authors of the book. So, I took it home and scanned it. It's one of those slices of Americana that I love.